Description: Our Personalized Hard Plastic Cups are a visually appealing and affordable method to promote your business or personal event. 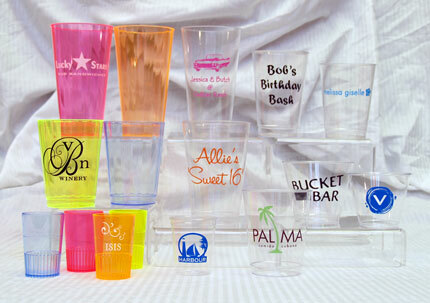 We can print your logo, monogram, custom artwork, or choose from our available typestyles and stock art on a variety of hard plastic cup sizes. These hard plastic cups add a touch of elegance and beauty while still being practical, safe and disposable. Available sizes in Clear Hard Plastic - 2oz, 5oz, 8oz, 9oz, 10oz, 12oz, 14oz, 16oz. Available sizes in Neon Hard Plastic - 1.5oz Shot, 10oz, 16oz. Available colors in Neon Hard Plastic - Red, Yellow, Blue, Orange. Your choice of ink colors include light blue, blue, royal blue, navy blue, purple, orange, black, ivory, cream, light yellow, yellow, tan, light brown, brown, red, dark red, pink, hot pink, burgundy, light grey, dark grey, lime, green forest green, turquoise, gold, copper, and silver. 2 ounces: 50 for $48, 100 for $67, 250 for $111. 5 ounces: 50 for $52, 100 for $76, 250 for $135. 8 ounces: 50 for $51, 100 for $74, 250 for $129. 9 ounces: 50 for $52, 100 for $75, 250 for $131. 10 ounces: 50 for $52, 100 for 75, 250 for $132. 12 ounces: 50 for $63, 100 for $99, 250 for $192. 14 ounces: 50 for $70, 100 for $114, 250 for $229. 16 ounces: 50 for $70, 100 for $115, 250 for $231. Neon 1.5 ounces: 50 for $63, 100 for $99, 250 for $192. 10 ounces: 50 for $64, 100 for $101, 250 for $196. 16 ounces: 50 for $96, 100 for $170, 250 for $370. Quantities are available in 50's, please inquire for other pricing. Prices are for one color ink (contact us for 2 color pricing).